5 oils. 5 uses. 1 multi-miracle. Luxurious beauty oil pairs antioxidant olive leaf extract with five organic vegetable oils to richly hydrate skin, nourish hair body and face, cleanse skin of all traces of makeup, ease worry and stress, and promote relaxation. Body care : Apply after the shower or the bath on dry skin, massage into skin. Hair care : apply on the hair and let rest few hours, then rinse and wash.
HELIANTHUS ANNUUS SEED OIL** - OLEA EUROPAEA LEAF EXTRACT** - PRUNUS ARMENIACA KERNEL OIL** - CORYLUS AVELLANA NUT OIL** - RUBUS IDAEUS SEED OIL - VITIS VINIFERA SEED OIL** - PARFUM- TOCOPHEROL MIXED - LINALOOL - LIMONENE - BENZYL BENZOATE - BENZYL SALICYLATE - FARNESOL. Athena struck her spear into the ground and an immortal tree was born: the Olive tree, capable of feeding and caring for the people. Created by women, for women, Oliv’ represents the strength and spirit of Athena and the Olive tree. 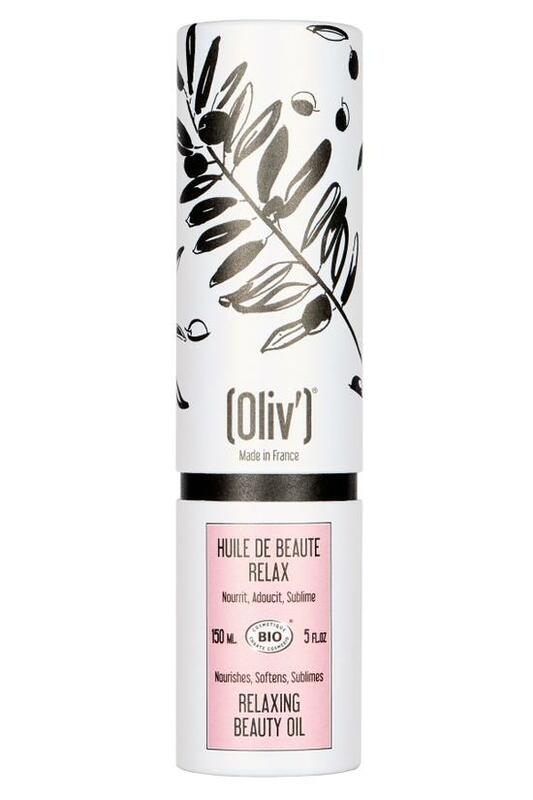 A natural and organic collection of luxury skin care from Provence, France, Oliv’ centers around the anti-aging power of olive leaf extract and Vitamin E, renowned for their antioxidant, detoxifying and healing properties (up to 400 times greater than Vitamin C).